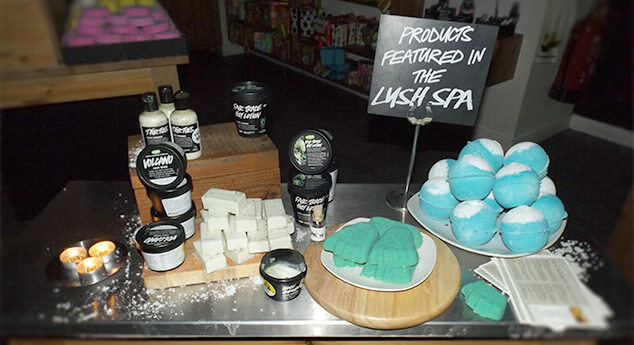 Lush is one of my favourite places to visit. Not only does it involve shopping, beauty and spoiling myself slightly, but I always feel better and happier just by popping in. So when I heard I could try out their spa treatments I jumped at the chance! Upon entering LUSH I was greeted by the usual gorgeous smells, welcoming staff, and brightly coloured goods; but tonight it was lit only with little tea lights dotted all around the room, and had Willy Wonkers famous tune playing softly, giving the whole evening a magical feel to it. Each spa treatment is tailor made to suit the individuals skin (and emotional) needs, giving them the best and most relaxing experience possible. Which was why I found it strange that I ended up having a foot treatment, as my feet are one of my most disliked body parts! I felt reassured and quickly at ease with them though, and was very glad I had been able to have such a treat. It started off with a warm bath for my feet with the BIG BLUE bath bomb, which helps exfoliate while still keeping our skin soft. To continue with this my feet were massaged with the stepping stone bar which I was advised to ‘break a toe off per foot’ when using. Now most people (including myself) HATE having their feet touched, or are very ticklish, but I loved the whole time! It wasn’t ticklish but relaxing and made my feet almost feel like they weren’t there they were so relaxed! Volcano is a fantastic foot mask! It works on exfoliating and refreshing your feet, making them smoother. With this they were wrapped up in a warm towel so they didn’t get cold. While my feet were wrapped up I had a hand and arm massage using, the Peace massage bar which soothed my aching hands and fingers and some Hand Guru Hand cream as I have very sensitive, dry hands. Normally my hands dry out quickly after using hand cream, but they have FINALLY met their match in the form of hand guru, keeping them soft AND moisturised! To finish off my feet were thoroughly washed in clean warm water, dried and treated to some fair trade foot lotion being massaged in. This was very cooling and made me feet feel so cool, fresh and ready to take me to wherever I am going to. Overall I loved the whole refreshing and relaxing experience that made my feet feel brand new, and myself, like I could take on the day no matter where my exfoliated, moisturised feet took me! This treatment was created by a founder of LUSH who was going through hard times and wished to have something to help her move forward; so of course feet came to mind so she could stride past her difficulties and onto more happy (and relaxed!) times. This treatment did this perfectly for myself, and I would recommend it to anyone especially those who dislike their own feet! NOTE *It is safe for pregnant women who often suffer with sore feet!